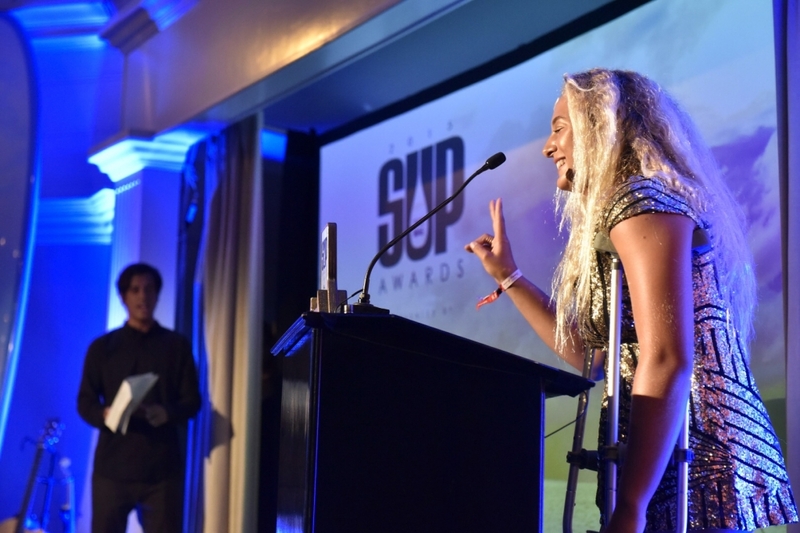 It was another historic night at the 2015 SUP Awards presented by Tommy Bahama, where the ballroom at the San Clemente Casino showcased an impressive array of the world’s elite athletes, philanthropists and filmmakers. Hundreds attended for a night to remember at the gala event celebrating the year’s best. Returning SUP Awards’ hosts Sam George and Dave Boehne supplied a class act as they dished out awards voted for by paddling fans around the world. Caio Vaz was voted top Male Paddler of the Year—a first for his home country, Brazil — and Izzi Gomez took top Female Paddler of the Year. Kai Lenny (#2) and Connor Baxter (#3) were also honored as top paddlers for their always impressive performances this year, along with Candice Appleby (#2) and Annabel Anderson (#3) on the women’s side. Scoring his second Molokai 2 Oahu title with an act of brute strength in abnormally light winds, Travis Grant earned the award for Best Male Performance of the Year. Candice Appleby accepted a well-deserved Top Female Performance trophy for dominating 2014’s Battle of the Paddle, coming back from injury to secure her sixth title. For Tahiti, 18-year-old Poenaiki Raioha brought home the Male Breakthrough Performer award, a promising title contender with a bright future on the Standup World Tour. Dana Point’s own Shae Foudy earned her award for Female Breakthrough Performer with a spectacular race year, as the 16-year-old took first place at the Santa Monica Pier Paddleboard Race and also Race the Lake of the Sky. Among the most prestigious acknowledgements in standup paddling, the SUP magazine Lifetime Achievement award stands alone as the industry’s “Hall of Fame.” This year’s recipient, Chuck Patterson, is as deserving a member of the paddling community as any. A pillar of the SUP movement long before its popular inception, Patterson represents a small community of paddlers who pioneered the sport for millions to follow. He was honored to accept the award and closed out the ceremony, which was followed by a rowdy party at the Casino.